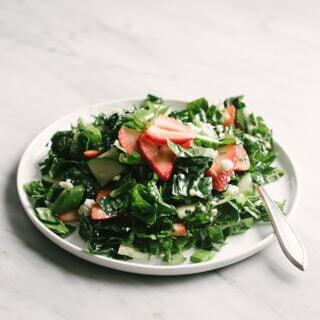 This strawberry kale salad is flavor packed nutritional powerhouse. Take advantage of best of spring produce with this healthy, seasonal spring salad with farm fresh strawberries, leafy kale, snap peas, mint, and just a touch of crumbled blue cheese. It’s finished with an easy, tangy balsamic vinaigrette and the whole ensemble is spring salad perfection…. 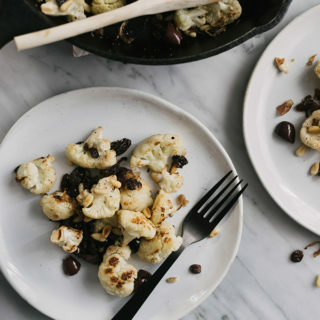 This recipe for roasted cauliflower with olives, raisins, and a pine nuts is a fun, easy, and fast twist on roasted cauliflower. A little bit sweet, a little bit salty, and completely and utterly addictive. 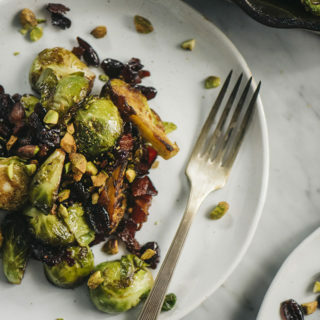 This recipe is paleo, whole 30, and vegan. You’ll never go back to basic roasted cauliflower! So, first things first….